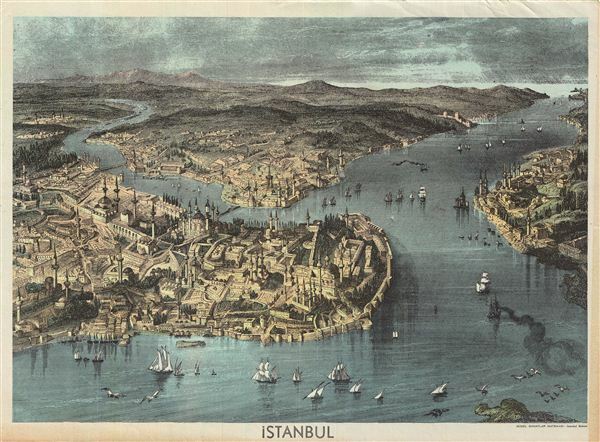 An appealing was process color lithograph view of Istanbul, Turkey. Issued around 1890 by Guzel Sanatlar Matbaasi (Fine Arts Printing) of Istanbul. Most likely prepared for this tourist trade, this map offers a beautiful view focused on the Sultanahmet District of Istanbul. The Topkapi Palace, Blue Mosque, and Haggia Sophia are notable. Very good. Verso contains three black and white views.